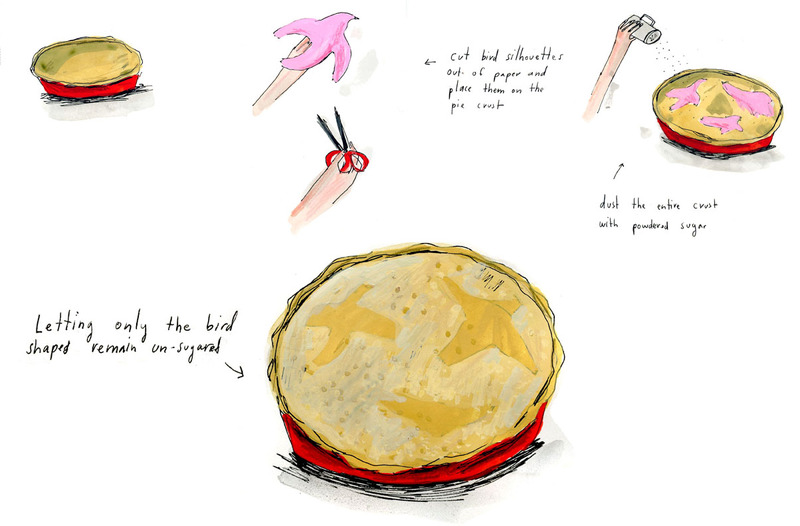 Nothing in the House: Four and Twenty Blackbirds Pie on The Hairpin! Four and Twenty Blackbirds Pie on The Hairpin! Last month, for National Pie Day (not to be confused with International Pi(e) Day, coming in March), Elizabeth and I had a piece on one of my most favorite sites on the interwebs, The Hairpin! It's an illustrated history of the fabled "4 and 20 Blackbirds Pie" which appears in the Mother Goose rhyme Sing a Song of Sixpence. 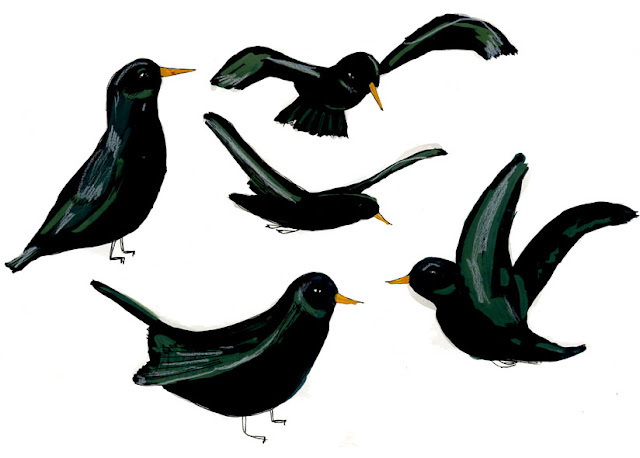 This piece, which features some of my mose favorite illustrations from Elizabeth yet (those blackbirds! ), was also the reason that I made that rather odd Stargazy Quail Pie (so THAT explains it!). You can visit the original post on The Hairpin, and read all the lovely and funny (and spam, unfortunately) comments here, but it's also posted below (though sans comments), in case you don't want your web surfing experience to turn into a "diverting Hurley-Burley". Though there are a few days that claim to be THE “Day of Pie”-- the U.S. House of Representatives recognized “Pi Day” on March 14th, and a second somewhat dubiously decreed “National Pie Day” on December 1st, according to the American Pie Council, today, January 23rd is the actual “National Pie Day.” It was probably chosen so that people have at least one thing to look forward to after the pie-promises of Thanksgiving and Christmas have faded, and you’re left cold and hungry in the depths of mid-winter. 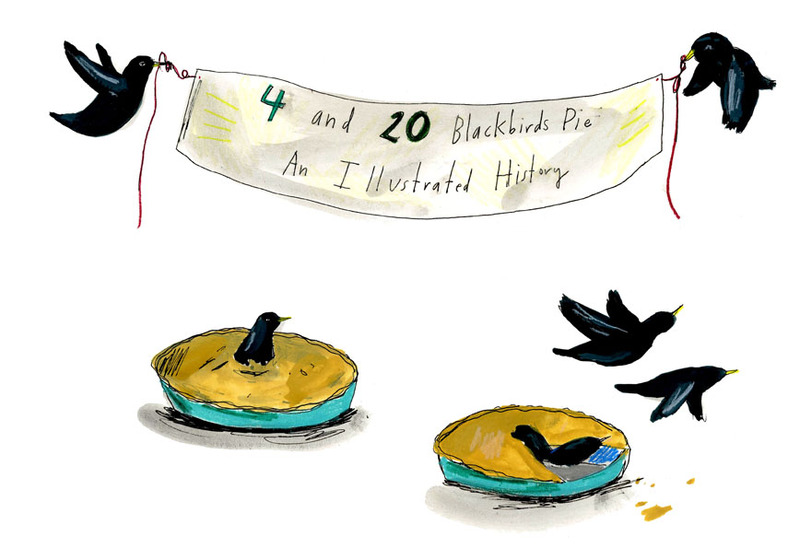 In honor, of this, we present an illustrated investigation and recipe of the legendary 4 and 20 Blackbirds Pie. We all know the nursery rhyme, Sing A Song of Sixpence, from the classic Mother Goose. This is the first verse of the rhyme as it first appeared in print in the mid-1700s. In its subsequent publication in 1780, these additional verses were added and the “naughty boys” were replaced by blackbirds. It’s entirely unclear how those twenty-four devious boys all turned themselves into blackbirds, but one cannot know the ways of the devil. We do know that somehow they managed to and are thus transformed for the rest of all history. Though “four and twenty” may seem a random number to us now, it is actually the most frequently appearing number in Mother Goose, representing, perhaps the 24 hours in a day, or a double dozen, 12 being a fabled number in religion and mythology. “A bag full [of Rye]” may have been an actual culinary measurement, like the teaspoon and tablespoon of today. And though there’s no rye mentioned, blackbirds inside a pie could be a reference to this recipe containing live birds, from the 1549 Italian cookbook Epulario or The Italian Banquet by Giovanni de Roselli, translated into English in 1598. Make the coffin of a great Pie or pasty. in the bottome whereof make a hole as big as your fist, or bigger if you will. let the sides of the coffin be some what higher then ordinary Pie, which dome. put is full of flower and bake it, and being baked, open the hole in the bottome and take out the flower [flour]. then having a Pie of the bignesse of the hole in the bottome of the coffin aforesaid. you shal put it into the coffin, withall put into the said coffin round about the aforesaid pie as many small live birds as the empty coffin will hold besides the pie aforesaid. And this is to be done at such time as you send the Pie to the table, and set before the guests: where uncovering or cutting up the lid of the great Pie, all the Birds will flie out. which is to the delight and pleasure shew to the company and because they shall not bee altogether mocked, you shall cut open the small pie and in this sort tart you may make many others, the like you may do with a Tart. This type of surprise pie, or coffin, as they were called, was likely actually made, being related to a genre of Medieval food called solteties, which used illusions in sugar (sound familiar?) and other stunts to impress guests. The live bird pie is later referred to in 1723 by John Nott, cook to the Duke of Bolton, as an antiquated practice with the aim that the birds in flight would extinguish the candles lighting the dining hall and create “a diverting Hurley-Burley amongst the Guests in the Dark”! 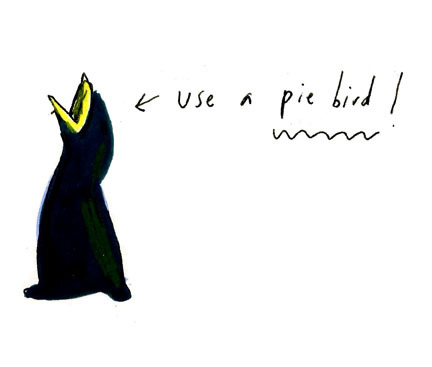 -DO use a pie bird! A ceramic funnel, usually in the shape of a bird, which you insert in the middle of a pie to let steam and juices escape. 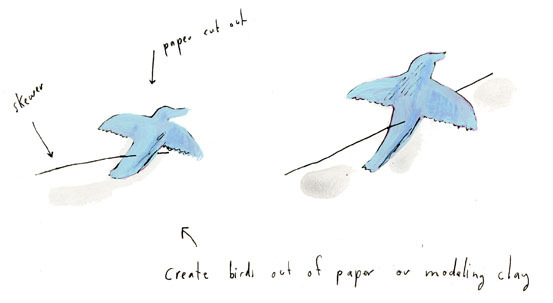 -DO create birds out of paper or modeling clay, attach them to skewers and insert them into the pie. -DO cut bird silhouettes out of paper and place them on the pie crust, then dust the entire crust with powdered sugar, letting only the bird shapes remain un-sugared. -DO (If you dare) make a Stargazy Quail Pie! Recipe here. WARNING: Not for vegetarians or the faint of heart. -DON’T mold blackbirds out of pie crust dough and bake them in the pie. You will end up with deranged Calvin and Hobbes snowmen-type figures (the 24 naughty boys return!) when the butter melts. Believe me, I’ve tried.